This book contains abundant information about the mass manufacture of Hydrogen Energy related gases. Including explicit details about the, chemistry and methods on the manufacture of all of the gasses important for the hydrogen revolution. Industrial gases covers Hydrogen, Oxygen, Nitrogen, Carbon Dioxide, Sulfur Dioxide, Ammonia, Producer Gas, Illuminating Gas, Acetylene, Ozone etc… Anyone who thinks that these gases do not have anything to do with a Hydrogen Future has been swallowing the mush that the media and other non-do'ers have been pushing. Hydrogen—you know this one. Oxygen is a byproduct of H2 manufacture in some cases. Nitrogen is used with H2 to make Ammonia. Carbon Dioxide is reduced to Carbon Monoxide and combined with water to make Hydrogen. Sulfur Dioxide is used to make sulfuric acid which is a hydrogen carrier ( and ten thousand other things), Ammonia is a hydrogen carrier (and a thousand other things), Producer Gas and Illuminating gas are excellent carriers of hydrogen and are easy to make, Acetylene is a huge part of our hydrogen future and Ozone is a powerful oxidizer that can be used in other chemistry to make more H2. Anyone who thinks that these gases do not have anything to do with a Hydrogen Future has been swallowing the stupefied public mush that the media and other idiots have been pushing. This is the seventh of a series of manuals of technological chemistry. It deals with the subject of gases of industrial importance, a subject that has been revolutionized like few others over the years. Perhaps the most striking advances have been made in regard to the subject of the liquefaction of gases, especially of air. As a result of such advances, large industries concerned with the production of gaseous oxygen and nitrogen have come into being. These industries to some extent revolutionized engineering practices and created entirely new industries such as the manufacture of cyanamide, widely used, as manure and as the basis of manufacture of many nitrogen compounds. 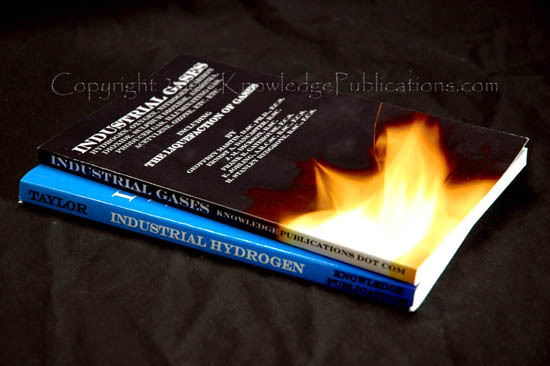 The subject of hydrogen gas of course has quite recently acquired greater importance than ever before; an enormous amount of recent research work has been done on this subject. But methods for producing the gas cheaply on the large scale were worked out long ag and a full account of these methods is given in Industrial Gases! The Linde Process—In this process, the expansion of the compressed gas takes place by simple outflow. Fig. 8 gives a diagrammatic representation of the laboratory type of Linde machine. A machine of this type producing 5o litres per hour requires 2 H.P. per litre, and begins to produce liquid after about ninety minutes' working. Fig. 25 represents a diagrammatic sketch of the apparatus employed for making nitrogen fur the manufacture of calcium cyanamide. Air is forced through the iron tubes AA, which are filled with granulated copper. The oxygen is absorbed and the nitrogen passes on, to be absorbed, say, in the calcium carbide in the retort. Diagonal Grate Producers—In the Duff producer (Fig. 30) the grate-bars, as will be noticed from the diagram, run across the bottom of the producer, not, however, occupying the whole area, forming in section an inverted " V." The air blast enters beneath the grate, whose form ensures that the air is uniformly distributed over a large area of fuel, and readily admits of the clinker being pushed into the water trough below. In the Thwaite "Simplex" producer (Fig. 31) the grate, underneath which the air blast and steam enter, slopes in one direction only. This producer is also water-sealed. Feldmann's Apparatus is shown in Fig. 38. The ammoniacal "gas-water flows into a tube from the regulating tank and enters the multitubular preheater " a, consisting of a series of tubes through which the ammoniacal liquor flows, which are themselves heated by the steam and hot gas coming from the saturator R by the pipe MM. From the "preheater " the now hot ammoniacal fluid flows into the top chamber of the column c. This is provided with a number of compartments each provided with an overflow pipe D, so that in each compartment the liquor accumulates to an appreciable depth. In the centre of the floor of each compartment is a wider pipe covered over with a " bell " or " mushroom " (e), provided with serrated edges. Through this central pipe the ammoniacal gases and steam come up from below and stream through the liquor surrounding the " mushroom," and thus boil out all the volatile NH3. Fig. 68 shows Humphrey & Glasgow's apparatus. The generator A is a steel shell lined with firebricks. It is charged with anthracite or coke which is ignited and submitted to an air-blast, which is forced in through the tube A,- and enters at v. Part of the fuel burns to CO,„ which, passing up through the hot coke, burns to producer gas (C0.2+ C 2C0). This passes away through i and enters the carburettor u, passes down this and then enters the superheater c at the bottom by means of the tube p. Both carburettor and superheater are steel shells lined with fire­brick and filled with brick checker-work simultaneously with the entrance of the gas into them a stream of air from g is blown in through the side tubes h, f, a', e, causing the CO to burn and thus heat the brickwork in 13 and c to a red heat the gas then passes out of the furnace through the opened stack valve z, escaping into the air as CO2. In the Lowe process, as practised in the U.S.A., the production of CO and the subsequent blowing in of air into 13 and c to burn it is avoided by blowing air very rapidly through the producer A, so that a sufficiency- of oxygen is present all the time, and only very hot CO;, passes away into r and c and heats them to the required temperature. When the proper temperature of the different parts of the apparatus is obtained the air blasts are shut off, beginning with that of the superheater c, and the stack valve z is closed. Steam is then blown into the generator A through the tube v, and is decomposed by the hot carbon in A according to the equation HoO C= CO + H.). It then passes into the carburettor as water gas. At the same moment the oil is introduced into the carburettor 13, being pumped in through the tube k, and falling on the red-hot bricks in B is gasified, its vapours mingling with the water gas and passing on to the superheater c, where the oil vapours are permanently gasified, and thence through / (where the incoming oil is preheated by the hot gas) into the washer D (consisting of a tower filled with coke down which water trickles), where it is washed and cooled, finally passing away at Y to the purifiers and the gas-holder. When the temperature of the mass of coke becomes too low the steam is shut off, the stack valve z- opened, and the air-blast readmitted. Tindal-de Vrise System—No solid dielectric is here employed. Each ozoniser (Fig. 74) comprises a horizontal semicylindrical metallic trough, fitted her­metically with a glass cover and provided externally with a water jacket. Semi-discs of metal, having serrated edges, are suspended from the cover at short intervals and form one electrode. The metal trough is earthed and forms the other electrode. To prevent sparking, a series of high liquid resistances, consisting of tubes filled with glycerine and water, are arranged in the circuit. The silent discharge takes place between the semicircular high-tension poles and the water-cooled inner surface of the trough, and between the poles the air to be ozonised is circulated. Five or six such cells are arranged in series. An ozoniser, due to Tindal, is shown in Fig. 75. The arrangement is self-explanatory from the diagram given. Abraham-Marmier System.—In this ozoniser the discharge surfaces consist of glass plates whose outer surfaces are cooled by water circulating in the surrounding air-tight metal tank. Since the water serves as a conductor, being in contact with the high-tension poles, a high resistance, in the form of a number of water showers, is employed to prevent short-circuiting through the water (Fig. 76).